KCP&L sponsored its annual software development contest for Northwest graduate students. Left to right in the front row are members of the winning team Sai Sirisha Devineni, Bindu Veeramachaneni, Nonso Okika and Aawaj Joshi. Left to right in the second row are KCP&L representatives Jordan Kilmer, Tyler Mattoon, Seth Walz, Whitney Mallett, Jory Galloway and Hayden Rainey. 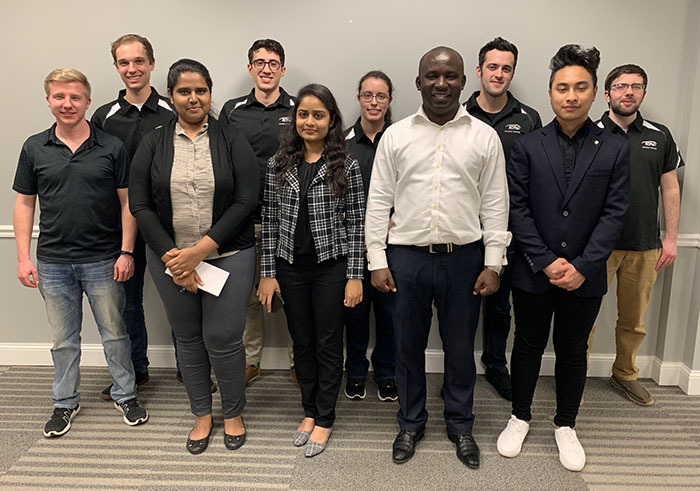 Four teams of Northwest Missouri State University graduate students earned cash prizes Monday as Kansas City Power and Light sponsored its annual software development contest at the University. During the contest, students were tasked with designing a safety reporting application that tracked injuries and other incidents for a new company. The students were charged with creating a mock-up of the app, including its database, network and other components, within a three-hour timeframe. Students had 15 minutes to present their solutions to a judging panel of KCP&L professionals. The challenge is designed to resemble professional work the students will see in the information technology field. It tested the students’ problem-solving, collaboration and communication skills while giving them practice at applying the skills they’re learning in their coursework. The judging panel from KCP&L awarded first place and $400 to a team consisting of Sai Sirisha Devineni, Bindu Veeramachaneni, Aawaj Joshi and Nonso Okika. “They gave us a lot of really good detail on their diagrams, and they did a really good job on their explanations,” Jory Galloway, an application developer for KCP&L and 2011 graduate of Northwest, said. Faculty in the School of Computer Science and Information Systems selected 16 deserving students to compete in the contest from Northwest’s graduate programs in applied computer science and information systems and assigned them to four different teams. Second place and $300 went to Sai Kiran Peddachappali, Raja Srikar Karthik Chinta, Shivani Busireddy and Wendy Eloe. Third place and $200 went to Bhaskar Gottemukkula, Anuraag Naidu Sanakkayala, Sai Anusha Yerukonda and Havya Ravipati. Fourth place and $100 went to Sonam Gadekari, Pallavi Kallamadi, Prashanth Kumar Thallada and Lokeswari Pittu. Since the fall of 2008, KCP&L has sponsored an undergraduate research competition for students in Northwest's School of Computer Science and Information Systems. In spring 2010, KCP&L initiated a second competition for teams of students who are completing graduate studies within the School. In addition to providing students with an opportunity to apply their skills, the contests allow students valuable face-to-face time with computing professionals who are recruiting interns and future employees.